I think what is happening to your father is probably due to his state of mind. You should talk to him and explain to him who Dorje Shugden is, his benefits and that he is an emanation of Manjushri. That might help to ease his mind. Sometimes having an image of a deity can disturb some people’s minds because they do not know who the deity is. This is especially the case if they are not familiar with the form of the deity. To them it may seem strange at first, but once they know the benefits of Dorje Shugden then their minds will calm down. You can explain to your father about the benefits of Dorje Shugden’s practice. 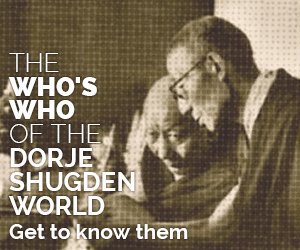 You can find a list of these benefits here: http://www.dorjeshugden.org/benefits/how-dorje-shugden-helps. Since your father is an amputee, he may be suffering from mental stress at having lost his limbs. This is very common with people who have been amputated, even if not recent. If you father is open to the idea, you can ask him to chant Dorje Shugden’s mantra, which will bring him a lot of peace. You can also move the image to another location of the house if your father does not like it where it is. I hope this helps. Thank you.